Provide comfort for the family of Lillian Robinson with a meaningful gesture of sympathy. Lillian B. Robinson, age 78, passed away on Friday, November 30, 2018. A Celebration of Life will be held at 2 p.m. Monday, December 3, 2018 at the chapel of McReynolds-Nave & Larson Funeral Home with the Rev. James Sanders officiating. She will be laid to rest in Greenwood Cemetery. Lillian's family will receive friends from 5 to 7 p.m. Sunday and 12 noon until the hour of service Monday at the funeral home. Born on March 17, 1940 in Grantsboro, North Carolina, Lillian was one of nine children to the late Erban and Molly Harper Brinson. 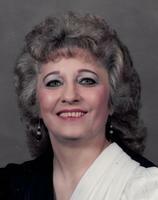 She was a retired seamstress and a member of Hilldale Bapist Church. Survivors include her children, Susie Robinson, Cathy Robinson Link, Barbara Robinson Wilson, John Lee "Buddy" Robinson, Jr. (Barbara), Jackie Robinson Valentine, and Larry Robinson (Sandra); sisters, Ramona Gray and Cora Reagan; and her eleven grandchildren and fifteen great grandchildren. Lillian was preceded in death by her beloved husband, John Robinson, Sr., her brothers, Roy, Curtis, Jack, Joseph, Baby Boy Brinson, and her sister, Opal Miller. Pallbearers will be Chad Link, James Valentine, Greg McCollom, Jr., Jon Robinson, Richard Nolen, and Terry Parker. Condolences may be made online at NaveFuneralHomes.com. To send flowers in memory of Lillian B. Robinson, please visit our Heartfelt Sympathies Store.